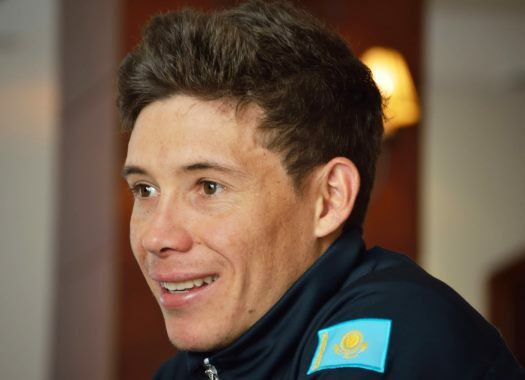 Astana's Miguel Angel Lopez has taken the overall victory of the Tour Colombia. Nairo Quintana won the stage in a thrilling mountain finish. The last stage of the Colombian race was 173.8 kilometres long between El Retiro and Viva Palmas with a tough mountain final on a first category climb. The escape of the day included men like Edwin Davila, Wilmar Paredes and Alex Cano. The front men were caught with 14 kilometres to go and as the last climb started. With eleven kilometres to go, Kevin Rivera (Androni-Giocattoli) attacked and a kilometre later was joined by Movistar's Winner Anacona and Davide Villella. Anacona was eventually left riding on his own while behind Miguel Angel Lopez (Astana) made the first move and then Movistar's Nairo Quintana overtook him and kept going until he got to the front man. The two Movistar men were joined by Team Sky's Egan Bernal. Soon the chasers caught the front men and after that, there were several attacks by Quintana, Ivan Sosa, Bernal and Lopez. With three kilometres to go, some fans crashed against the front men and took Quintana and Bernal to the ground, while Lopez and Sosa went ahead. Sosa went back to help Bernal returning to the front, but the rider didn't have the strength to keep going at a high rhythm. Sosa and Quintana rejoined Lopez in the last kilometre and soon the rider of Movistar overtook the other two and went on to win the stage. Lopez crossed the finish line in the third position and that was enough for him to take the overall victory of the race.